Acer PREDATOR 21X is the miraculous model featured by Acer in order to beat even the boldest competition. There are many things to be taken by the surprise. Sure enough, ten years ago, there are many things we didn’t believe would make their appearance by now. Certainly, the last thing we thought about is the bulky, monstrous, 21-inch, curved display, gaming laptop featured by Acer. The first time it made its’ appearance on the scene was in late 2016, when it appeared at IFA event. However, we were sure that Acer stepped up its game only when we saw it shine at the CES held at the beginning of 2017 in Las Vegas Convention Center. Despite the never before seen looks, badass performance, and indescribable features, the vastest highlight of the night was the whopping $9,000 price-tag. Here’s everything that we know about the Acer PREDATOR 21X, so far. Well, like we mentioned before, we already knew about Acer Predator 21X in August last year, when it was first announced by the Acer staff. In a world full of competitive laptops, especially in the gaming industry, it was more than understandable that there will be even ridiculous steps taken in order to grab the innovation crown. Given that laptop, basically, sounds like a device we would rather hold in our laps and take everywhere with us, replacing the desktop. 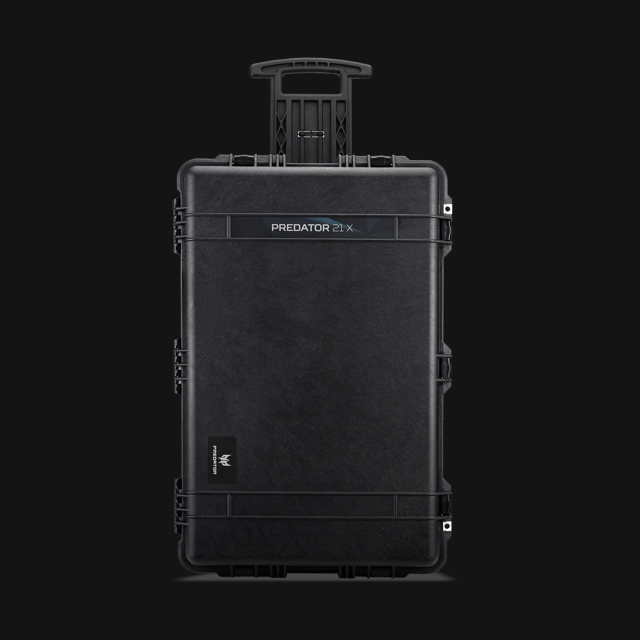 It often sounds confusing, why would someone have a 19.4- pounds weighing laptop, that he can’t take anywhere and if you could, you would have to pack it in a travel luggage for traveling. That being said, it doesn’t make much sense why would someone have a laptop that ridiculously big, especially given the price tag. Then again, Acer Predator 21x houses amazing features, beneficial as much for the gaming industry, for the video editing and design ones as well. Continue reading this article in order to get familiar with everything behind this future-proofed beast. How does Acer Predator 21 X look like? It looks like everything we could possibly imagine only in Sci-Fi movies. 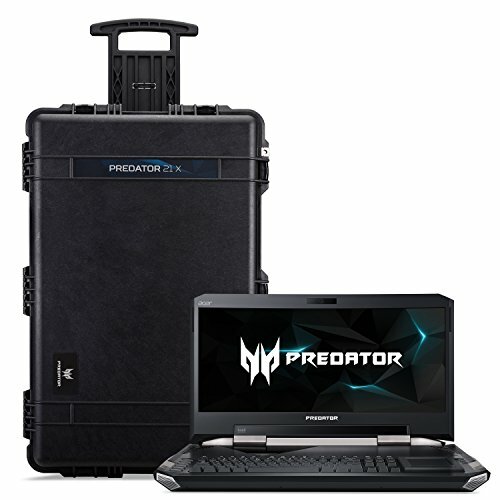 Exactly, Acer Predator 21 X comes packed up in a large suitcase, given it most possibly won’t fit in your laptop bag, and its’ 19.4-pounds ergonomics sound impossible to be carried the way you would carry your ordinary, 15.6-inch gaming laptop. The suitcase looks very nice, its’ insides are filled up with foam in order to keep the laptop fixed, comfortable, and safe. Additional levels of security were provided with dug holes at the bottom for fitting the two power supply ports. That’s right, one power supply is not sufficient to make this laptop run. How would it? When it is the most powerful and monstrous laptop ever released, even more than Asus ROG water-powered laptops. The first time the laptop was introduced to the public, everyone looked at it with awe. Understandably, its’ aesthetics scream the “look at me” gaming attitude, bold, sinister, and strong. 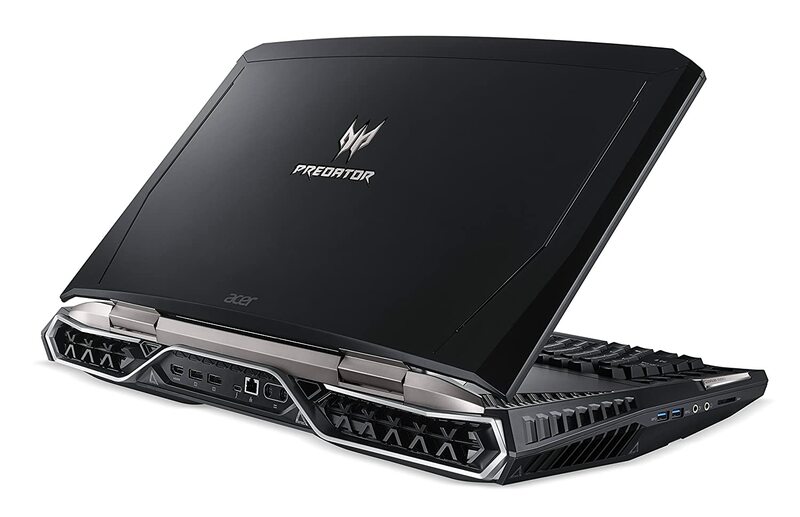 The color of the laptop is black, but the carved “scratches” and silver lines together with the etched Acer Predator sinister logo. Surprisingly, when you open laptop, not everything is covered with the keyboard. Instead, the keyboard takes much less than a half of the lower pad. It is still large, backlit keyboard that promised by Acer feels like the dream for gamers, allowing them to play interruptedly and more skilled. The most innovative peak is around this part either. The touchpad, that is very sleek and responsive, flips upside down to be the right, numerical pad in cases when you need it. It solves the major problem every laptop had, whereas the, more than essential, numeric pad seldom found its’ space on 14-inch and 13-inch laptops. As we mentioned above, the keyboard takes a little more than one-third of the entire space. Instead, above the keyboard, next to the enormously and unnecessarily large power button, there is a wonderful, dragon accented graphics that can be removed in order to reveal the window that takes the glimpse of several components inside the laptop, including the spinning fan. We weren’t surprised when we saw a lot of ports on Acer Predator 21X. Aside from Ethernet and HDMI, and Display Port, we saw four of USB 3.0 ports and five USB 2.0 ports. Additionally, there are the headphone and microphone 3.5mm adapters. Unfortunately, the lack of optic drive is disappointing. You will have to settle for Netflix movies and series, instead of the physical DVD and Blue-RAY discs. For gamers, it is easy, as the vast majority of games are easily accessible through Stream and Origin networks. Acer promised at CES that the laptop will be upgradable. This is a good news, considering no one wants to spend $9,000 just so that in next two years, they would have to buy a brand-new laptop. This option allows the users to upgrade graphics card(s), CPU, or something else. Acer Predator 21 X sports an innovative 21 inches curved screen, the biggest screen a laptop would normally have. Amazing aspect ratio is fixed at 21:9, assuring the clarity, sharpness, and sufficient color transparency enough to bring the in-game world to life. Its curvy design is unique in order to align with the peripheral vision of gamers. It is color-rich, and with great viewing angles, it gives the certain level of advantage to the PvP-hungry gamers. It hosts the maximal resolution of 2,560 x 1080 giving the gaming a completely new meaning. There are many display-related bells and whistles worth pointing out. It supports the famous Nvidia G-sync technology for a more adjusted graphical setting and performance. Its’ refresh rate is clocked at 120Hz. The gamers can rest and enjoy the lag-free and no flickering gaming performance. The secret weapon of the screen is hidden beneath the thin layer of plastic and LED lights. It is called Tobii eye-tracking technology. How does it work? Acer has ensured that this technology will follow your eye’s movement in the Tobii technology compatible games. The reason it is beneficial is that thanks to your eye tracking, the camera will remain steady, preventing your character to find themselves at the edge of the screen. Found yourself in an unexpected and unpredictable melee? Tobii’s eye-tracking technology has got you covered. The only more impressive highlight than Predator 21X’s curved screen is its robust configuration. If a gamer could imagine what would the gaming paradise look like, it would be beneath Predator’s metal housing. The processor that runs this machine is nothing less than Core i7 2820HK quad-core processor with speed fixed at 2.9 GHz. The user will never have to worry about running out of storage as there is a 1TB agile hard drive, together with PCIe solid-state drives, with incredibly swift transfer and access speeds. Furthermore, Acer allowed them to be set in RAID 0, which unleashes even more speed. Acer wasn’t saving on RAM power either. Predator 21X has none-less than 64GB of DDR4 RAM, clocked at 2,400MHz. 64 GB of RAM is more than necessary to run the games of the latest generations and all those RAM-juicing, graphics-demanding programs for graphics and video editing. Still, nowhere near in the future will there be a requirement of 64GB to run a game. It’s truly the graphics card that contributes to its divine gaming performance. Should we, perhaps, say cards? Acer Predator 21X houses, not one, but two graphics cards. There are two of Nvidia GTX 1080 graphics cards in SLI version. Of course, belonging to the Pascal series of graphics cards, Nvidia GTX 180 is suitable for VR gaming, providing more than sufficient 90 FPS, even in the most demanding games. Acer Predator 21X has 5 built-in fans to make sure the laptop will always be supplied with cool air not to overheat. Two power supplies don’t look promising for the battery. The 17-inch gaming laptops can’t overcome the deadly three-hours long battery life. It would be hard for a 21-inch laptop to get past two hours. At its’ best, we can expect Predator 21X to last one and a half hour in an intense video streaming test. That means, barely enough for a short full HD movie. See exciting 10 Best 17 Inch Laptop Review in 2019. In the end, Acer Predator 21X didn’t amaze everyone. For many, it is more cost-effective to buy a desktop. There are a lot of doubts about placing this vigorous machine on your lap, which is why many call it ridiculously sized. Its’ most distinguished peak is the Tobii eye-tracking technology. After all, we believe that this technology should breathe life in many other gaming machines. Still, it is vastly expensive, either limited and unavailable to many. All in all, we love it as much as we hate it. More importantly, we will all agree that it is admirable, and most definitely, the strongest gaming laptop in the world at the moment.